Want to fix a small dent or ding in your pickup? Here’s how using five easy steps: drill, pull, fill, sand, and paint. Before you start ensure that the area you are repairing is clean and dry. 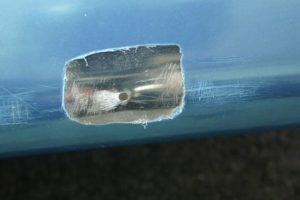 Start at the outside of the dent and use an electric drill to drill a small hole in the center of the dent. Insert a dent pulling tool through hole you drilled. These are usually plunger type tools. Pull firmly on the dent pulling tool using even pressure. Once the dent is pulled as close to even as you can get it, it is time to climb under the car. If you can reach the dent, use a rubber mallet to hammer out the dent using light strokes until the dent can no longer be seen on the exterior of the car. Be careful to only hammer where the dent is to avoid causing more bumps that will be visible from the exterior. When hammering be sure to start at the shallow end of the dent and slowly work your way out to the deeper areas. Apply a small amount of body filler into the hole. Be sure that the filler you get is the correct type for your body (e.g. made for plastic, steel, or aluminum). Use a putty knife to spread and smooth the filler. You want to spread it as thinly, evenly, and smoothly as you can. Let the filler dry according to directions. This may take a couple of hours. Wearing a dust mask, sand the filler until smooth using short side to side movements. It is recommended that you use 1500 grit sandpaper that is slightly wet. You can fill in any small pits with more body filler as needed. You want to have an extremely smooth finish, and to be sure that your sanding follows the contours of your body. Spray the filler with touch up paint that is the same color as your pickup. Let the paint dry according to directions. Sand the touch up paint on your pickup using short side to side movements until the paint is even with the rest of the pickup. It is recommended that you use 2000 grit sandpaper that is slightly wet. ← Can I put a Headache Rack on my Truck? A Guide for Truck Owners.